Well, at least she knew that there is an "n" in the word. 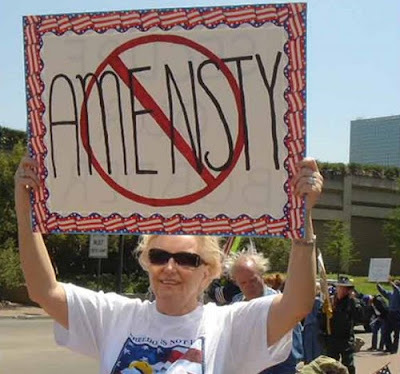 I hope her English teacher gave her amensty on the spelling tests. I would comment on all of these signs were it not for fear of being called "elitist," or worse, "English Major do you want fries with that?" I liked the photos of farmsteads in Iowa, glad the Warbasse Manor is still functioning. Well, call me elitist if you must. The signholders may not be at the top of the pecking order, but, hey, look at the guys the signholders are kicking around. I have sympathy for both groups, because they face the greatest exposure to our modern economy. I just don't have a lot of patience for half-baked populism that usually ends up in the wrong kind of people getting elected. Felix! Now I have seen the picture and figured out who it is. Thanks for stopping by and saying hello. Come back again sometime. I hope all is well in Chattanooga.